For better or worse, NHL often seems like a mini-TechyDad. Like me, he loves math and tries to work it into anything he does. He’s also a natural when it comes to computers. On the down side, he seems to either focus in on what he wants to do to the exclusion of everything (and everyone) around him or his brain goes a mile a minute and he has trouble staying on task. NHL does have a big advantage I never had, though. Whereas I had to come up with strategies to deal with my shortcomings on my own, NHL has me as a resource. Having personally experienced many of the things he’s going through, I can be there for him and teach him what I’ve learned along the way. 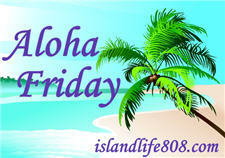 My Aloha Friday question for today is: Does your child strongly resemble (physically, personality, or otherwise) you or your spouse? My son is a carbon copy of my husband. My middle daughter looks exactly like me when I was her age. My other 2 girls look like each other. We are still trying to figure out where their blond hair came from! My girls have something of both. Hubby says she is like me,lol. well imagine that..she is adopted, so I guess traits can be learned. Friends who do not know say she looks like me. Now that I can not explain! He’s very much like my husband in looks and personality. though he did get my chin!!! I think our son is a lot like my husband although some say he looks like me. My daughter looks a good bit like me but the jury’s still out on who she takes after more personality-wise (she’s only 15 months old). My oldest is starting to copy my artistic style…I mean, when he’s not drawing Star Wars. He made some Scribbleprints just like me. I got all teary! My other kids have picked up some of our good and bad habits…and especially our sayings. My two year old picked up my habit of talking with my hands…we have video of him talking and gesuring just like me, only in baby talk. Gale recently posted..Maternity Shirts on Sale!